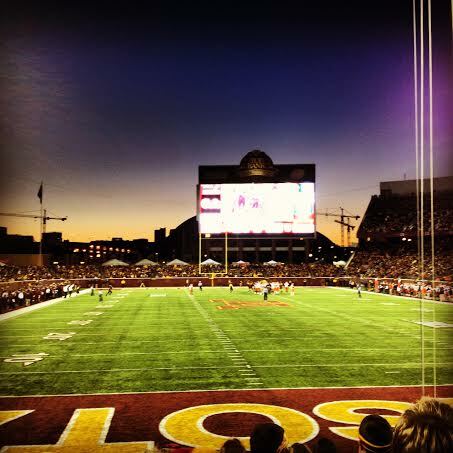 A view of the football field at TCF Bank Stadium during Gopher football. As a music geek, I love a good drum line. I find it pretty cool for a bunch of people with one type of instrument to make a whole song sound full. I’ll never love drumming more than I do than the fact that Drum Corps International has to move their annual date for their competition at TCF Bank Stadium on the campus of the University of Minnesota in Minneapolis. Why? Per a press release, Drum Corps International was knocked off for ‘a major concert’. This major concert will correlate with the MLB All-Star Game that will be occurring at Target Field in downtown Minneapolis this summer. A concert is fun and all, but the Star Tribune’s list of potential semi-educated guesses is what makes it fun. The Strib points to Prince, Garth Brooks, Pearl Jam, Bruce Springsteen, Paul McCartney, and Kenny Chesney as the potential headliners at the second major concert to happen at The Bank. I’m going to power rank who I want it to be and you won’t be surprised, but the thought of one out of 50% of this group happening is amazing. 6. Pearl Jam – I’m not a Pearl Jam guy. I haven’t listened to a lot of Pearl Jam. There is no Pearl Jam in my music library. Sorry, Pearl Jam. 5. Kenny Chesney – Kenny is extremely popular in the country music world, I know because I live there. Kenny has been to Minnesota two years in a row at Target Field, he doesn’t need to come again. Plus, currently Chesney has no tour plans for this summer making him a so-so candidate in the first place. If Kenny has a fantastic opening act, I’ll go. I like Kenny just not enough to break the bank. 4. Prince – The Strib pointed out that Prince hasn’t done a major show in Minnesota in a long time and it would be cool if he was the guy. I don’t know if I would pay super bucks to see Prince, but it’s a for sure sellout. Prince puts on a hell of a show apparently, too. 3. Bruce Springsteen – You know it’s a good list when I put Springsteen at number three. I love Bruce and if it’s Bruce, Lord knows that I’ll put a lot of good money down to see him again. Bruce is the live king and he’ll be on tour in America later this summer. This might make the most sense on an already on-tour basis. The Boss and the E Street Band just slip because of who else is on the list. 2. Paul McCartney – Sir Paul is one of the performers on my bucket list and, to paraphrase something Springsteen said in a recent interview, you can start to see the light at the end of the tunnel. McCartney isn’t going to be around forever, no less touring forever, and I want to see him before one of us leaves the game. The ex-Beatle is still figuring out 2014 tour plans, so this would be a good thing to start the setting of his plans. 1. Garth Brooks – I’ve been a Garth Brooks fan my whole life. I’m young enough though that by the time I was of concert going age that Garth Brooks had taken his hiatus to spend time with his girls in Oklahoma. I’m ready to see Garth. It’s one thing I’ve been looking forward to in my music loving career since I can remember, the problem is that this probably won’t be the venue. Garth will come to town, I’m 110% positive of that, but this is before his big she-bang in Ireland. The Strib points out this would be a good tune-up, but when Garth does something, he does it big. Other than maybe a couple more Vegas dates, I’d expect Garth to fire it up in Ireland and keep it trucking until the big rig runs out of fuel. I hope I’m wrong. Contrary to rumors elsewhere, Bruce Springsteen will not be the concert’s performer. Neither will be Garth Brooks. Baseball is still considering concert performers. The show is expected to include multiple acts. If it truly is going to be multiple acts, that means there’ll be little to no big names. Have fun with that lovers of mediocre bands.